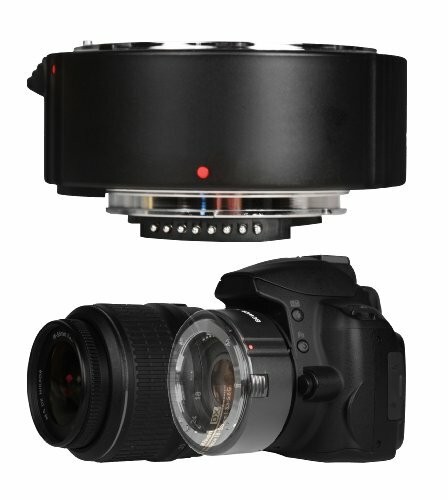 Compatible with Sony Alpha and Minolta Maxxum DSLR camera lenses For a proper fit. Teleconverter with multicoated optics Doubles the focal length of your existing lens for enhanced options. Ideal for use with lenses with a maximum aperture of f/4.0 and greater. High-quality, portable design Lets you easily take the teleconverter on the go. 4-element construction Features multicoated optics for clear images. Autofocus and manual focus Offer flexible use. The 2x DGII Teleconverter (4 element) for Sony uses upgraded multi-coated optics to double the focal length of the existing lens. Using the 2x DGII teleconverter with an 85mm f/1.4 lens, for example, will double the focal length to 170mm, which effectively sets the maximum aperture at f/2.8 (cutting the amount of light captured). Also known as a tele-extender, it serves as an excellent lens modifier that is portable, high-quality and versatile. The lens used must have a maximum aperture greater than f/4.0 in order to fully utilize its autofocus capabilities.